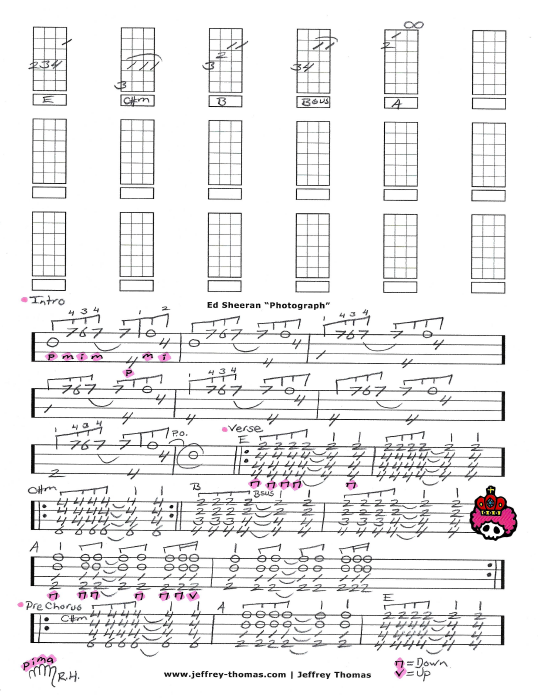 Ed Sheeran Photograph Free Ukulele Tab by Jeffrey Thomas. I did my best to match the guitar part from the original recording. There is some fingerpicking and strumming required to play this tune. Make sure to check out the preview video for playing tips! Want the ukulele tab for free? Send in your email using the form provided. Looking for online ukulele lessons? Fill out the Schedule A Free Lesson form to set up a class today. The piano loop which is the basis for “Photograph” was composed by Snow Patrol member Johnny McDaid. “Photograph reach the top five on charts in five different countries. Find more great online ukulele tabs on my blog, video and tab pages.